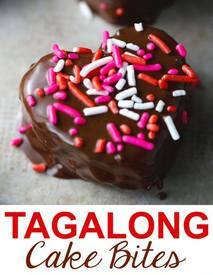 Tagalong Pound Cake Bites taste just like the famous Girl Scout cookies without the crunch. Tender pound cake covered with creamy peanut butter, dipped in luscious, melted chocolate. Can I get a yum, people! Don't forget- heart shaped for Valentines!